Amazon Web Services (AWS) offers a complete set of infrastructure and application services that enable you to run virtually everything in the cloud: from enterprise applications and big data projects to social games and mobile apps. Display estimated total charges for all AWS services (in USD). Display metrics from AWS CloudWatch namespaces such as EC2, RDS, ELB and more. Search for Amazon CloudWatch using the Search sources field. Alternatively, you can also scroll down the alphabetical list of integrations until you reach the Amazon CloudWatch integration. Click on the Amazon CloudWatch integration. 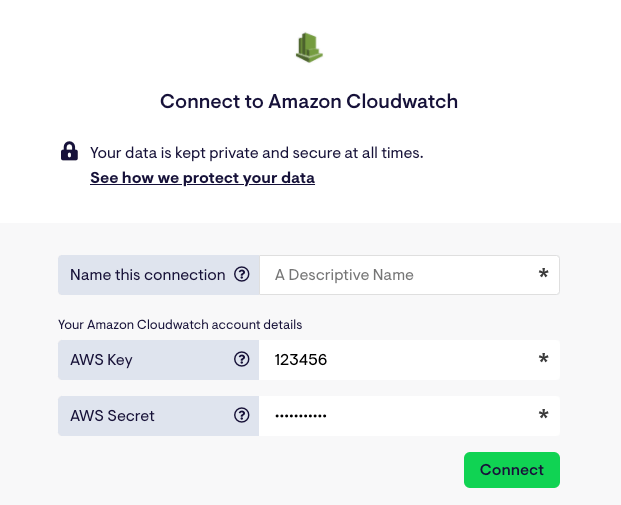 When adding your first Amazon CloudWatch widget, you'll be asked to create a connection and authenticate your Amazon CloudWatch account so that we're able to collect your data and display it on the dashboard. You only need to create this connection once – we'll take care of the rest. You'll then need to enter your AWS Key and Secret. These are required by Geckoboard to access your Amazon CloudWatch account. In line with best practice, we recommend using Amazon's IAM facility to create a separate access key and secret that has read-only permission on your AWS account. To allow Geckoboard to send requests to the AWS API, please ensure that the IAM user that you have added to Geckoboard has "Action":["cloudwatch:ListMetrics", "cloudwatch:GetMetricStatistics"] in its policy.